Podręczniki z serii „RockyNook” nie bez przyczyny cieszą się ogromnym uznaniem w środowisku profesjonalnych fotografów. Wchodzące w jej skład książki w całości poświęcone są tytułowym zagadnieniom, stanowiąc bardzo obszerne i szczegółowe źródło wiedzy z zakresu profesjonalnej fotografii. Autorzy podręczników kierują się tradycyjnym założeniem tzw. „europejskiej szkoły fotografii”, oferując przejrzyste, konkretnie sformułowane wskazówki i zalecenia. Photographers are just beginning to realize the potential of HDRI. Now, using similar, even newer techniques based on a bracketed series of exposures, it is possible to go beyond high dynamic range: Photographers can increase resolution for ultrasharp, detailed images, or they can extend the depth of field in a way that was never before possible. Photographic Multishot Techniques provides a thorough introduction and a hands-on guide to these various techniques. Using a series of example images, the authors explain and illustrate the use of each technique in great detail. Included are lessons on HDRI, superresolution, focus stacking, and stitching. Moreover, the reader will learn how to effectively combine these techniques. 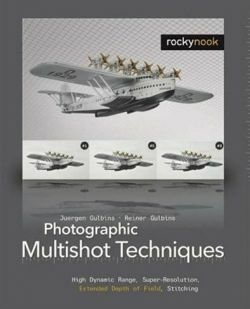 Throughout the book, the authors use tools such as Photoshop, PhotoAcute, Photomatix, FDRTools, CombineZM, and Helicon Focus to illustrate the workflow with step-by-step instructions. Many of these tools (either full or test versions) are found on the CD that is included with the book. Learning these techniques will help to expand the repertoire and improve the photographic skills of the professional as well as the advanced amateur photographer.